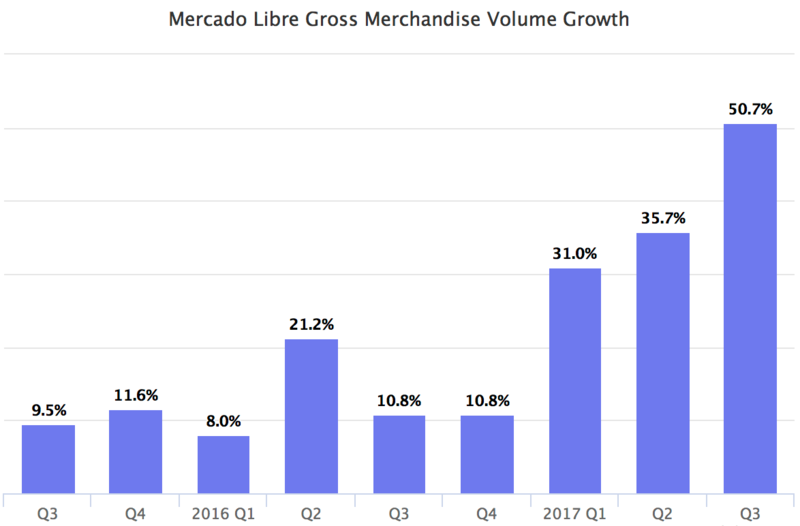 In 2017 Q3 Mercado Libre‘s Gross Merchandise Volume (GMV) for the first time surpassed the $3 billion mark, reaching $3,075.3 million dollars. Up by 50.7% from the same quarter a year before. The GMV growth has been accelerating so far in 2017, and Q3 growth was the fastest in years. Mobile share of GMV is on its way to reach 50% soon - it increased from 36% to 47% in just one year. Two years ago in 2015 it was just 26%. Items sold reached 74.2 million, growing fastest in over five years at 55.8% year-over-year. Live listings for the first time surpassed 100 million reaching 106 million in Q3. The $3 billion in GMV came from 4.6 million unique third-party sellers. The number of items sold per unique seller is increasing too. All metrics showcasing the health of the market, both on Mercado Libre level, and for Latin America overall, are looking strong. Every quarter there are more people shopping online, mobile shopping is soon to overtake desktop users, and the number of businesses selling on marketplace is increasing. Latin America has much lower internet penetration than the US, and e-commerce as a percentage of total retail sales is half that of the US, but it is not standing still. Three weeks ago Amazon Brazil expanded the marketplace by adding an electronics category. Overnight the marketplace grew 20% in terms of sellers, and has only continued to expand. By now it has more than doubled since the category launched. The Amazon marketplace in Brazil had 1,400 sellers on October 17th, and as of November 6th it is at over 3,000 sellers. This announcement caused stock prices of Latin America e-commerce companies to fall drastically. Mercado Libre stock price fell 14% that week. However strong Q3 performance has reassured investors, and thus the stock price has mostly recovered. Brazil - the 10th largest e-commerce market in the world - accounts for 62% of Mercado Libre revenue, so the impact of a successful Amazon marketplace in Brazil would be big. However they are years away from being a threat. Mercado Libre launched in Brazil in 1999, and has amassed over 2 million sellers since then. The unique sellers metric in Brazil continues to grow, up 33% last quarter. Mercado Libre is building its own flywheel, fueled by free shipping, loyalty program Mercado Puntos, and marketing for customer acquisition. Which in the short term hurt profitability, but combined with their infrastructure services like Mercado Envios for shipping, Mercado Pago for payments processing, and merchant lending Mercado Crédito will make them an infrastructure company, and not a website where retailers can sell through. Which is exactly why Amazon is the winner in the US market.